Everyone is always looking for a way to brighten whites and keep white clothing pieces looking their absolute best. There are many products sold and marketed to help us keep our whites bright and appealing. Products like chlorine bleach and bleach alternative are available to you. But, chlorine bleach can be harmful to clothes and it can actually contribute to changing the color of your white pieces. There are also organic options that can be used to launder whites and maintain them appropriately. After several washes, whites can become dull, dingy, yellow or grey. Commercial bleach is the most popular way people choose to brighten their clothes. Alternatively, you can use a more ecofriendly substance and gentler approach to organically brighten your whites. Here is how you can launder whites organically and save some money while you’re doing it. Read on. Give your items a pre soak. Soak your white clothing in a gallon of warm water and hydrogen peroxide. If you have more than one item, increase the amount of water you will soak the clothes in to 2-3 gallons of water. Push the clothes into the water and make sure they are completely submerged and saturated. Rub the stained areas between your hands to encourage the removal. Rub gently, this will break up the surface of the stain. To your warm water add eight fluid ounces of white vinegar. If there are multiple pieces that need to be soaked and treated, add a little more white vinegar. Let your clothes soak in the warm water and white vinegar mixture for 1-2 hours. However, if your laundry is really dingy, allow for them to soak for 4-6 hours. You should rinse the white vinegar from your white items. Use cold water when rinsing. You can use the rinse cycle of your washing machine, or the bathroom or kitchen sink. Rinse each item one by one and take great care to ensure all the vinegar. You can dry your items using your normal methods. 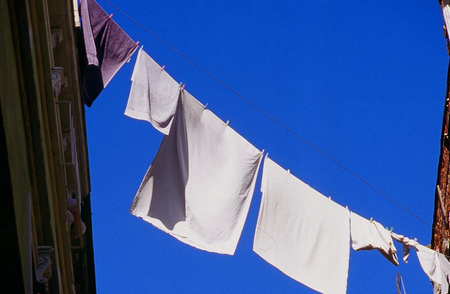 You can use a dryer or hang your clothes outside to air dry. To keep your white clothing looking bright and smelling fresh, add 1/3 cup of white vinegar to the rinse cycle of your washing machine. This will eliminate sweaty smells and even the smell of mildew. If you make this a part of your regular laundry routine, you should be able to see the results of your consistency. Clothes will not only be bright and whiter, they will also be fresh smelling. How to Boot In Safe Mode?